The Conjuring franchise has had a couple of rocky moments, but on the whole it’s proving to be a cinematic universe that’s sturdy enough to justify its existence as one (and seeing how it’s a Warner Bros property, it’s ironically stronger than the studio’s DC Universe right now, which was designed to directly compete against the standards set by Marvel). Only five films in, it’s had more hits than misses; both Conjuring movies and last year’s prequel Annabelle: Creation were all solid and entertaining movies that felt like they naturally belonged in the same universe, not to mention the fact that they worked very effectively as standalone horror films. The weakest entry is still the first Annabelle movie from 2014, which was nothing more than a bland imitation of original director James Wan’s spooky style that was nowhere near as scary or interesting; but coming in just behind it for a close second is sadly the latest addition to this franchise, Corin Hardy’s The Nun which focuses on that scene-stealing demon novice from The Conjuring 2, as well as its backstory and how it ended up in the world of the living. That’s pretty much what you get with this movie, and as world-building franchise entries go it’s hardly the worst out there, but unfortunately when it comes to scares, genuine intrigue and all-round sense-making, it falls far behind the stronger films in this series. It is set in 1952, at a secluded and partially-destroyed (thanks to bombs dropped on it during the war) abbey in Romania, where a nun is found hanged in an apparent suicide. 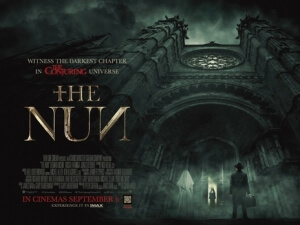 The Vatican sends Father Burke (Demián Bichir) to investigate the tragedy, and he is accompanied by young practising nun Sister Irene (Taissa Farmiga, the younger sister of Vera Farmiga who stars in the two Conjuring movies), who both travel to the abbey to find out what caused the nun to kill herself, but shortly upon arriving they find that the place is lorded over by an evil spirit who, of course, adopts the guise of a nun. Where this spirit came from, what it wants, why it remains here in this abbey and more, are all questions that the two, along with local French-Canadian village man named Frenchie (Jonas Bloquet), attempt to uncover before it can consume them all, but the film only really gives answers to a handful of them, and spends most of its time just trying to scare the Jesus out of the audience. That would be all well and good if it were actually scary, which it unfortunately isn’t for a lot of it. Most of these scares are just made up of a lot of stuff you’ve seen before in other horror movies, and done better as well, so you can easily spot when the next big jump-scare is about to pop out of the darkness, whether it be a creepy demon face or something just lunging out at a character from an unexpected place; again, these sorts of things have been in a lot of genre films like this, and they’ve even popped up several times in the past few Conjuring movies, but those films at least had a firmer idea of how to build on suspense and straightforward terror, whereas The Nun just tends to throw spooky image after spooky image at the wall to see what sticks. Every now and then, there is a genuinely unsettling shot that really gets under your skin, and you can tell that this director and cinematographer are actually trying their hardest, but those moments are rare and far few in between during this film, which doesn’t have a firm enough script to hold most of it together. This film is closer in spirit (no pun intended) to that first Annabelle movie than any of the other Conjuring movies, in terms of how it has some of the more forgettable characters in this series so far, with some of them making some very stupid horror-movie mistakes that see them end up in terrifying places that they only have themselves and their weak sense of logic to blame for. Though the acting is certainly fine for the most part, particularly by Taissa Farmiga who – facial likeness to her older sister aside, which does throw you off once or twice as you wonder if the two characters played by Taissa and Vera Farmiga respectively are related, which (mild spoiler alert) they aren’t – is a likeable performer, the cast isn’t given solid enough material to work with, and end up just reacting to one horrifying thing after another half of the time. More notably, the Frenchie character, played by Belgian actor Jonas Bloquet whose accent oddly slips so often to a point where you start wondering if he’s being played by an English-speaking actor instead, feels like he’s come from a different genre of movie half the time, throwing out one-liners and dressed in handsome leading-man clothes like he’s straight out of the Brendan Fraser Mummy movies or even Indiana Jones – in fact, the movie does kind of turn into an Indiana Jones movie during the final act, complete with an ancient religious artefact that acts as the ultimate MacGuffin of the story; you’re just surprised that to get it they didn’t have to go through all those obstacles from the climax of The Last Crusade. As much as this movie doesn’t really work as a standalone horror movie, let alone as a solid entry into this film series, it’s not like I had a miserable time watching this; there was definitely effort put into the making of this, and the acting is fairly solid, but in the end it’s just not a very scary movie, which given that its central focus is on one of the most terrifying things about The Conjuring 2 it comes off as an even greater disappointment. Although, compared to the last horror movie that I watched which was Slender Man, this movie might as well be one of the two Conjuring films. The Nun doesn’t offer as many scares or make as much logical sense as most of the previous Conjuring films, making it one of the more disappointing series entries, despite the fact that there was clearly effort put into making this one.